How to cut mylar solder stencils from ExpressPCB and EagleCAD files « Adafruit Industries – Makers, hackers, artists, designers and engineers! 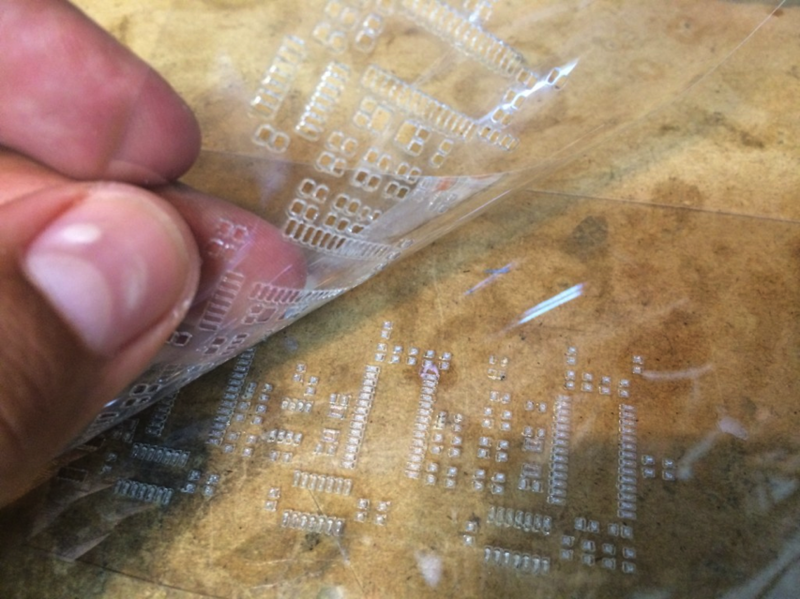 Juan’s Blog has a great tutorial up on how to laser cut mylar solder stencils. Via Hack a Day. In this post I’ll be going over how to cut out solder stencils for both ExpressPCB and EagleCAD designs on a laser cutter. I recently had a need to create some stencils from both of these programs and spent quite a bit of time at the Dallas Makerspace working with their laser cutter to get the settings just right. I’ll be cutting some designs that are mostly 0603/0805 package sizes, so don’t expect ultra-tight pitch stencils from this technique! Laser Cutter – The one at the space is a Full Spectrum 120W CO2 model. The technique that I chose to cut these stencils is to use two sheets stacked on each other to create the stencil. The first sheet is your actual stencil, and the second is a sacrificial sheet which will catch the melted pads of the first sheet and allow you to pull them off cleanly when you separate them. The trick here is to expose the mylar to just enough heat so that the first sheet cuts clear through, but the second doesn’t. You also don’t want to apply too much heat since that will cause small sections of the mylar to melt.